Beresheet couldn't slow down in time to avoid a crash. 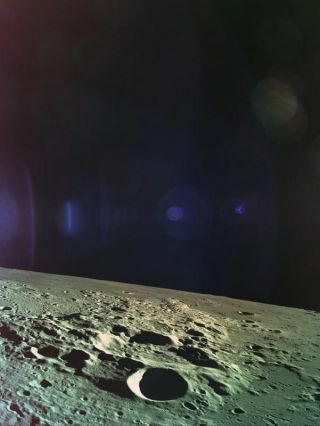 This was the last photo that the Beresheet spacecraft captured before it crashed into the lunar surface on April 12, 2019. Beresheet, the Israeli spacecraft that crashed into the moon during a landing attempt yesterday (April 11), was having problems with its main engine during its descent that left it unable to slow down in time before it smashed into the lunar surface. "A technical glitch in one of Beresheet's components triggered the chain of events yesterday that caused the main engine of the spacecraft to malfunction," engineers with SpaceIL and Israel Aerospace Industries (IAI), the teams that built and operated the spacecraft, said in a statement today (April 12). Engineers at the mission control center in Yehud, Israel, did manage to restart the engine before the crash, but "by that time, its velocity was too high to slow down and the landing could not be completed as planned," SpaceIL officials said in the statement. The engine problems started when Beresheet was about 8.7 miles (14 kilometers) from the surface of the moon. Beresheet beamed back one last photo of the lunar surface before it lost communication with Earth and slammed into the lunar soil. The final image arrived at SpaceIL's mission control room when Beresheet was 4.7 miles (7.5 kilometers) above the surface of the moon. Mission controllers lost contact with the spacecraft when it was at an altitude of 492 feet (150 meters) and barreling downward at a speed of 310 mph (500 km/h). "We seem to have a problem with our main engine," SpaceIL's commentator said during a live webcast of the landing operations. "We are resetting the spacecraft to try to enable the engine." A few seconds later, he announced that the main engine was back on — but it was already too late.